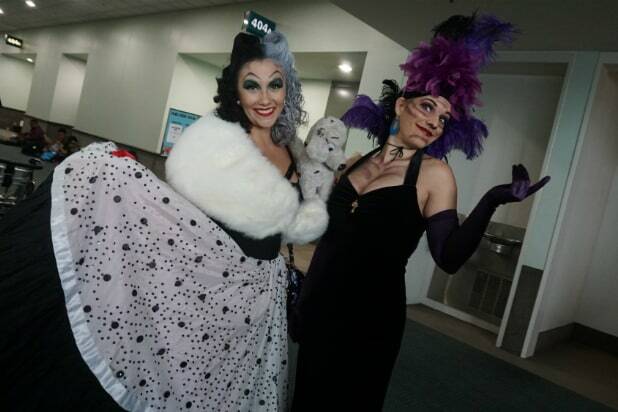 Disney's Cruella De Vil and Maleficent looked viciously chic at Stan Lee's Los Angeles Comic Con. 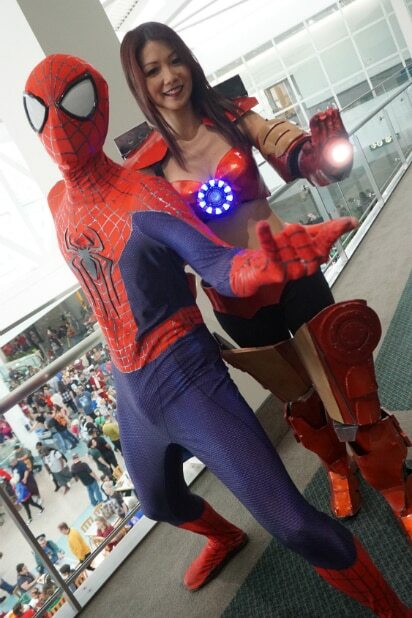 Spider-Man and a half-armored Iron (Wo)Man at Stan Lee's Los Angeles Comic Con. Twi'lek and Togruta ladies from "Star Wars" at Stan Lee's Los Angeles Comic Con. Disney Princesses at Stan Lee's Los Angeles Comic Con. Negan from "The Walking Dead" at Stan Lee's Los Angeles Comic Con. El Diablo, The Joker, and Harley Quinn from "Suicide Squad" at Stan Lee's Los Angeles Comic Con. Gamora from "Guardians of the Galaxy" at Stan Lee's Los Angeles Comic Con. The X-Men (and more) line up for a group shot at the end of Stan Lee's Los Angeles Comic Con. 707 from "Mystic Messenger" after a long day of hacking the system at Stan Lee's Los Angeles Comic Con. Armed to the teeth at Stan Lee's Los Angeles Comic Con. Marvel's Sam Wilson a.k.a. The Falcon takes aim at Stan Lee's Los Angeles Comic Con. Harley Quinn and El Diablo from "Suicide Squad" bust out of Stan Lee's Los Angeles Comic Con. Bebop, sans Rocksteady, from Teenage Mutant Ninja Turtles at Stan Lee's Los Angeles Comic Con. 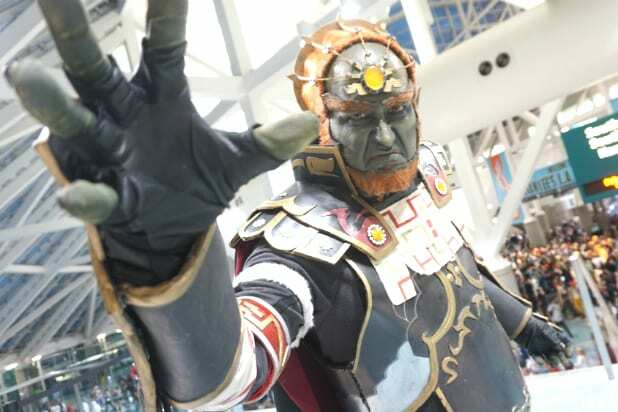 Walking through the halls of Stan Lee's Los Angeles Comic Con was like a journey through a "Labyrinth" of lovely costumes. Hanzo from "Overwatch" takes aim at Stan Lee's Los Angeles Comic Con. Bellatrix and Voldemort from the "Harry Potter" franchise haunted the halls of Stan Lee's Los Angeles Comic Con. Anna and Elsa from "Frozen" at Stan Lee's Los Angeles Comic Con. A meeting of the minds at Stan Lee's Los Angeles Comic Con. Harley Quinn took over the halls at Stan Lee's Los Angeles Comic Con. Everyone agreed that the armored security at Stan Lee's Los Angeles Comic Con was the best yet. Classic Spiderverse characters Carnage and Mysterio at Stan Lee's Los Angeles Comic Con. More Spiderverse madness at Stan Lee's Los Angeles Comic Con. Daft Punk (cos)played at Stan Lee's Los Angeles Comic Con. Ms. Marvel packs a punch at Stan Lee's Los Angeles Comic Con. Director Krennic took a break from building the Death Star to attend Stan Lee's Los Angeles Comic Con. She could be a Grand Admiral some day. More Imperial backup at Stan Lee's Los Angeles Comic Con. The kind of crew you don't mess with, all at Stan Lee's Los Angeles Comic Con.